RELATED: After This Fiasco, How Can We Trust Anything They Told Us About 9/11? An astounding video uncovered from the archives today shows the BBC reporting on the collapse of WTC Building 7 over twenty minutes before it fell at 5:20pm on the afternoon of 9/11. The incredible footage shows BBC reporter Jane Standley talking about the collapse of the Salomon Brothers Building while it remains standing in the live shot behind her head. This amazing clip was on Google Video (now back again here), but was removed within hours of the story breaking. However, hundreds of people had already managed to download the clip and it has gone viral on the Internet and the censors won't be able to shut the lid this time. A You Tube upload is available here but we fully expect this to be removed soon. You can watch it for the time being at this link and also here. A WMV link is here (on our server) and a Quicktime here. Bit torrent versions of the file can be found here. An avi version can be found here. To be clear, the Salomon Brothers Building is just a different name for Building 7 or WTC 7. Skip forward to around the 14:30 minute mark. Although there is no clock or time stamp on the footage, the source claims the report was given at 4:57pm EST, 23 minutes before Building 7 collapsed at 5:20pm. 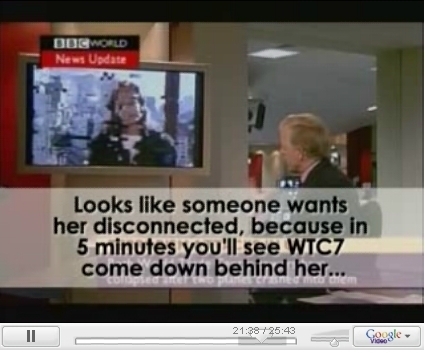 While the exact time of the report cannot be confirmed at present, it is clear from the footage that the reporter is describing the collapse of WTC 7 while it clearly remains standing behind her in the live shot. Alex Jones' film Terror Storm documents how Thermate was the likely culprit for the implosion of the twin towers and also explores the collapse of WTC 7. Moronic commenters on Digg are already trying to bury the story, yet none of them have an answer as to why the BBC reported the building's collapse before it happened. Click here to add your own comment and counter the debunkers. PRISON PLANET.com Copyright � 2002-2007 Alex Jones All rights reserved.